Are you looking for famous mosques in India? India is a land of many religions and cultures and every religion has its own faith, belief and places of worship. Here we are with 8 famous Masjid in India holy shrines of Islam visited most by Muslims and Non-Muslims in large numbers every day. A mosque is a place where Muslims worship like Hindus worship in temples. India is a home of many religions and every religion has its own holy shrines. 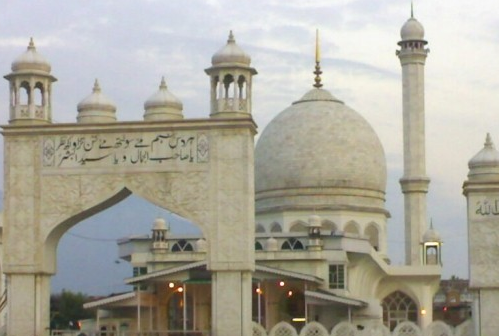 Here are the 8 most famous Mosques in India- Holy Shrines of Islam in India. India is a land of different religions and casts and being a democratic country every religion has the freedom to worship their god like they want. In India Hindu, Muslims, Sikhs and Christian all have their own worship places like Temple for Hindus, Gurudwara for Sikhs, Mosques for Muslims and Churches for Christian. Mosques in India not only has religious value but also famous for their architectural beauty and design too. Most of the famous mosques in India were constructed during Mughal Empire to exhibit the opulence of the rulers and political power. Ajmer Sharif, Jama Masjid, Fatehpur Sikri and Hazratbal are some famous mosques where millions and billions of devotees visit to seek the blessings of saints and prophets. 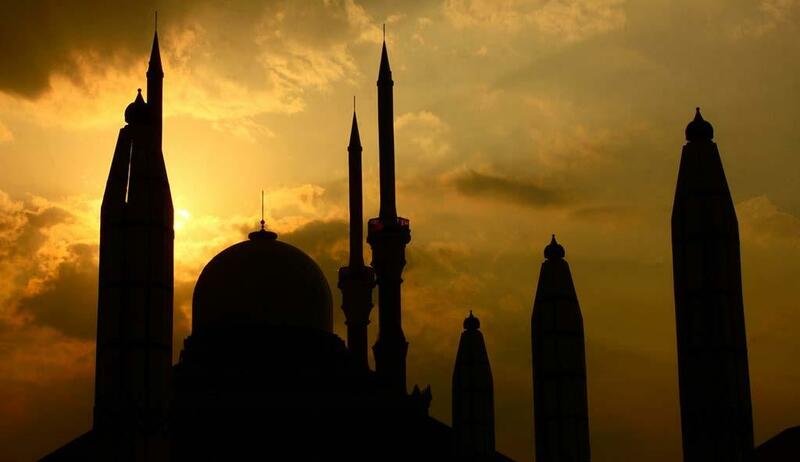 Read on to know the list of the 8 famous masjids in India. It is one of the famous mosques in India which is the dargah of Hazrat Khwaja Moinuddin Chishti a Sufi holy person at Ajmer situated in the heart of Rajasthan, India. It is an old saying that people who visit Ajmer Sharif and pray with the pure heart will free their soul. The Dargah Khawaja Gharib Nawaz has a few tombs, structures, passageways and patios all are the best example of Mughal architecture. People of all religions visit Ajmer Sharif to get the blessing of Hazrat Khwaja Moinuddin Chishty and offer flower and Chadar as a token of their faith. Inside Dargah Sharif, two big Deghs (pots) are installed for cooking Niaz (rice with ghee, nuts, saffron & sugar) to serve the needy people. 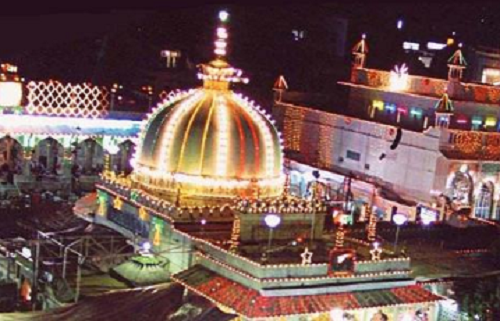 Every year URS Mubarak Festival of 6 days organised at Ajmer Sharif Dargah in the seventh month of the Islamic lunar calendar. It is the largest and famous mosque of India constructed in between 1644 and 1656 at the cost of Rupees 10 lakh. It was inaugurated by an imam from Bukhara, present-day Uzbekistan. The mosque was completed in 1656 AD with three great gates, four towers and two high minarets. The tower of the Jama Masjid five distinctive storeys with projecting balcony out of which 3 first storeys are made from Redstone fourth one with marble and the fifth storey is made from sandstone. There are three domes on the terrace. The main entrance of the Jama Masjid is on the eastern side facing the red fort. The whole Mosque is covered with intricate carvings and has verses inscribed from the holy Quran. The main prayer hall of the Jama Masjid is made up of high arches and marble domes. 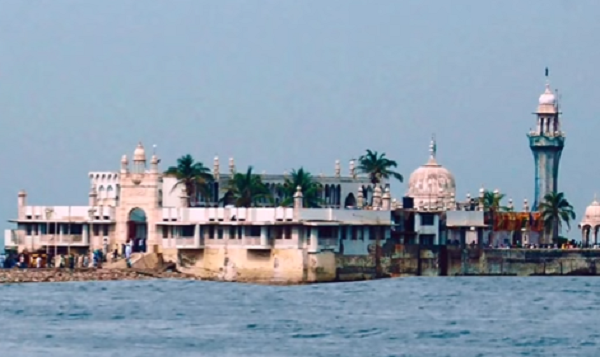 Haji Ali is one of the most religious shrines in Mumbai. People from all reign and cast visit Haji Ali every day to get the blessings of Muslim Saint Pir Haji Ali Shah Bukhari (R.A.). The structure has white domes and minarets reminiscent of the Mughal architecture of the period. The Dargah is one of the most visited shrines among the Muslims. Non-Muslims are also permitted to visit the Dargah and get the same treatment. Around 10-15 thousand devotees visit the Dargah every day. The quantity of devotees increased to 20-30 thousand, on Thursdays, Fridays and Sundays. Lakhs of devotees visit the Dargah on the second day of Ramadhan Eid and Bakri (Eid-ul-Uzha). It is the famous masjid in India which was built in the year 1784 by the fourth Nawab of Awadh known as Asaf-Ud-Daula to provide food and shelter for a major famine that took place in the year 1784. The Bara Imambara is a standout amongst the most celebrated landmarks of Lucknow. 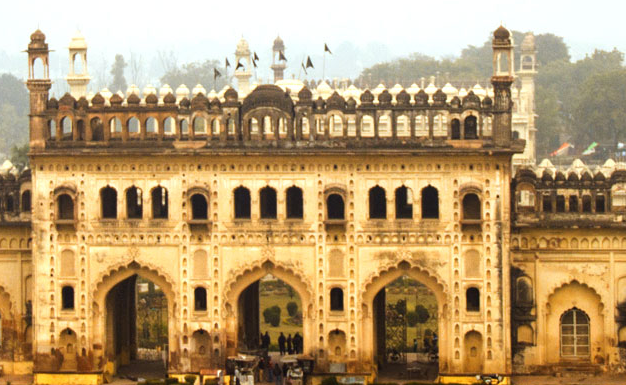 It is additionally called Asfi Imambara after the name of the Nawab of Lucknow who got it constructed. It is a religious place of faith and worship for the Muslims who come here every year to celebrate the religious festival of Muharram. The Bara Imambara has a unique style of construction. The centre lobby of Bara Imambara is said to be the biggest curved corridor in the word. The corridor measures 50 meters in length and goes up to a height of 15 meters. What makes the construction special is the way in which the blocks have been put together with an interlocking system of bricks without any use or support of beams and pillars. The rooftop stands consistently till date with no columns to support it. The Bara Imambara is known for its amazing maze called Bhulbhulaiya. This is situated on the upper floor of the monument. One can see a beautiful scene of the city from the highest point of the construction. The monument stays open from morning 6am to night 5pm. It is the first Mosque in India built in 629 AD by Malik Deenar, an Arab propagator of Islam and a devotee of Islamic Prophet Muhammad. Located in Methala, Kodungallur Taluk, Thrissur District in the Indian state of Kerala was initially redesigned or recreated at some point in the eleventh Century AD and later again 300 years back. The old part of the mosque including the sanctum sanctorum was left untouched is still preserved. It is a matter of pride that devotees and number of devotees visit to the shrine are from the non-Muslim community. Offerings of Iftar amid during the fasting month of Ramadan are being made by the non-Muslim communities. 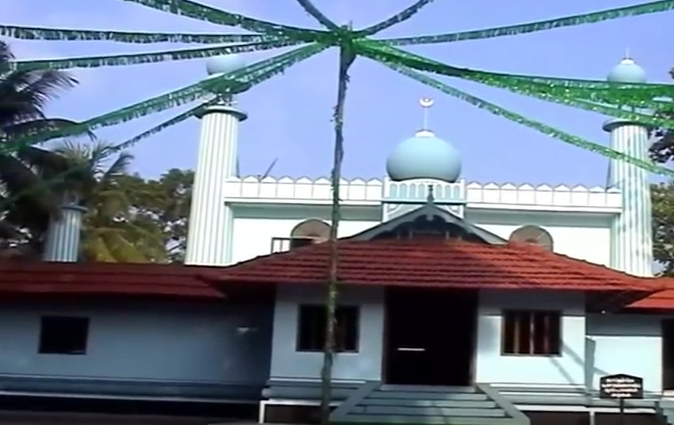 Numerous non-Muslim devotees are leading "Vidyarambham" of their youngsters at the mosque. Hazratbal Mosque is the most famous mosque in India and important holy religious place of Muslims. It is situated in Srinagar on the western shore of Dal Lake. It is made from white marble and looks mesmerising when reflected in the waters of the lake. Hazratbal shrine has special significance for Muslims as it houses a hair of the prophet Muhammad displayed inside a glass casket to the public on religious occasions, usually accompanied by fairs. Everyone has to cover his head before entering the mosque. The interior of the shrine is quite peaceful and cool for meditation and to prayer in peace. It actually signifies "The Crown of Mosques" situated in Bhopal, India. The mosque is also used as an Islamic school in the day time. It is one of the biggest mosques in Asia. The mosque has a pink exterior topped by two 18-story high octagonal minarets with marble vaults. The mosque likewise has three gigantic bulbous tombs, a great fundamental lobby with alluring columns and marble flooring looking like Mughal architecture resemble with Jama Masjid in Delhi and the beautiful Badshahi Mosque of Lahore. It has a courtyard with a big tank in the centre. Taj-ul-Masjid has the two-storeyed entryway with four recessed passages and nine cusped multifold openings at the main prayer hall. The construction of the Mosque was started during the reign of the Mughal Emperor Bahadur Shah Zafar but was not completed due to lack of funds, and after a long wait, construction was started again in 1971 by Allama Muhammad Imran Khan Nadwi Azhari and Maulana Syed Hashmat Ali Sahab of Bhopal. It was completed by 1985 and the entrance gate was renovated by using ancient motifs from circa 1250 Syrian mosques by the contribution of the Emir of Kuwait in loving memory of his dead wife. 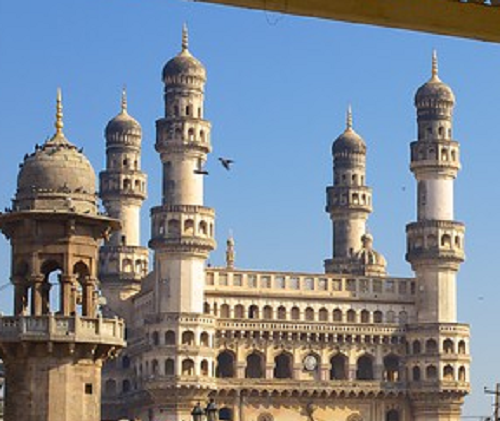 It is one of the oldest and famous mosques in Hyderabad and the largest masjid in India. 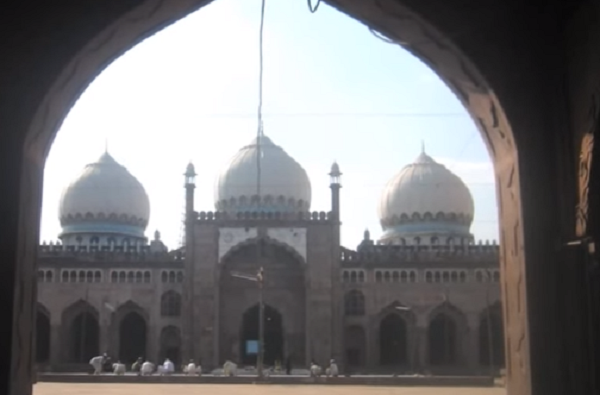 Mecca Masjid is also known as Makkah Masjid. Muhammad Quli Qutb Shah, the fifth ruler of the Qutb Shahi dynasty ordered that the bricks used for the construction of the central arch of the mosque to be made from the soil brought from Mecca, the holiest site in Islam. The Large hall of the mosque can accommodate more than 10,000 worshippers at the same time. People get amazed to see the beautifully patterned walls of the mosque made up of granite. The verses of the holy 'Quran' are inscribed on the arches of Mecca Masjid making it more divine. Mecca Masjid construction was completed by Mughal Emperor Aurangzeb in 1694. 15 beautifully designed arches support the roof of the main hall. Many rare artefacts and relics are displayed in a room located in the courtyard of the Mosque. 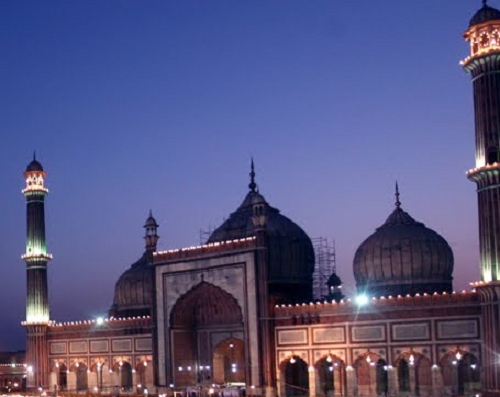 Jama Masjid in Delhi is really a great place to visit and one of the famous Mosques in India. I visited the Jama Masjid with my family. Masjid will be crowded during evenings and Fridays.